Just last week I talked glowingly about Lish McBride’s series of books. I decided to take a chance and email her publisher and I was rewarded with an ARC of her new book, Pyromantic! Thank you Morgan Dubin for sending me the book. Five chapters in and I’m already loving it! Review to come closer to the March publication. It’s been awhile since I did one of these. In fact it’s been 5 months. Oops. I think it’s about time I did another one, don’t you think? 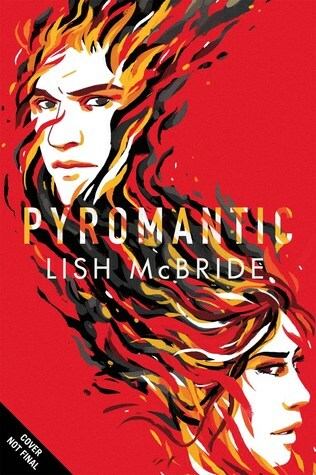 I can’t think of a better series to welcome back this column then Necromancer and Firebug series’ by Lish McBride. Really, I can’t believe I have waited this long to write about them. It’s actually two different series but they take place in the same world, just on opposite coasts. Necromancer consists of Hold Me Closer, Necromancer and Necromancing the Stone. Two of the best book titles in history of literature. I decided to read the first book based on the title alone. With a title like Hold Me Closer, Necromancer it had to be good right? Firebug at the moment is the only book in it’s series but the sequel, Pyromantic, another great title, comes out in March of next year. (I hope, I’m pretty sure. It’s released date has been pushed back more then once to my chagrin) They both take place in the underground world of the supernaturals. Sam, our hero in Necromancer is a necromancer. When he is discovered by another Necromancer he brought into a world of werewolves and other supernaturals creatures that he didn’t even know exist but now is in the thick of it. You’ll think about Seattle in a different way after reading this book. Ava, our little firebug from Firebug, is forced to work for the Coterie, a magical mafia. She along with her friends, Lock and Ezra, she must track down creatures of all kinds who are behind in their payments or doing something they are not supposed to. So why do I like these books so much? For one thing they are hilarious! Like laugh out loud funny you just can’t help yourself. The situations the characters get in are at times so ridiculous and absurd it’s just too funny. They are also very original. Sure, there are a lot of other books that feature werewolves, ghosts, nymphs and other supernatural beings but nothing is like this. I’m not sure how to describe the weirdness of these books but they just work. There is also a realness to them as well. Sam and Ava are both great protagonists. They both find themselves in situations that are out of their control but with the help of their friends and their own gumption they find ways out of them. They both have a little sassiness to them that I love in my characters. The supporting characters are more then just comic relief or filler but true characters in their own right. Firebug came out two years ago and I have been waiting (mostly) patiently for Pyromantic to come out. Like I said earlier, publication has been pushed back a few times because well life I guess. Lish Mcbride is not just an author but also a bookseller as well. The biggest secret of the publication world is that just because you have a book published doesn’t mean you are set for life. Most authors don’t live off of their writing. They have to have day jobs to make ends meet. Recently Lish started a Patreon page. If you not familiar with Patreon, it’s sort of a crowd sourcing website for creators and artist. You can pledge to give so much money a month to an artist and in return you get exclusive material from them. Lish so far has posted a new short story and read a chapter from Pyromantic. It’s been satisfying so far. It ties me over until her new book comes out and I also can feel good about supporting an author I love. It’s a cool way to support artists and all for that. So before Pyromantic comes out, I suggest you read Hold Me Closer, Necromancer, Necromancing the Stone and Firebug and read her public post on patreon page. You will not be disappointed. After I finished reading A Dance of Dragons, I decided I needed something quick. So I read three novellas. It has become a trend for YA authors with successful series to write short stories or novellas to supplement the series. Most of them are inconsequential. They may add a little hint of what’s going to happen in the series or they are just fluff. They can write a few stories. Publish them first as an e-book and then later can republish them all as a collection. Obviously both the author and publishers can get a little bit more out of a trilogy (not to mention, a little more cash) and keep readers interested between books. Authors use them to either bridge the gap between the end of one book to the beginning of another. Sort of a “What I did over the Summer” essay, one does on the first day of school. Other times, authors write a pivotal scene but from another characters perspective. Usually, it’s from the love interest’s perspective but not always. Other times, these novellas give authors a chance to play in the world they’ve created without really messing up the story they are writing. They can do this by writing a story about a supporting character that takes place outside the current story line. Sometimes, the stories are prequels. Giving readers a chance to see the hero or heroine before the series began or give a glimpse of life was before. Whatever the reason for writing the novellas, they are usually fun to read. The novellas I read came from very different series. The first is The Queen from the Selection series by Kiera Cass. This is actually the third novella from this series and the first that is a prequel, taking place long before the action of the first book, The Selection. First, if you are not familiar with this series. It’s been dubbed as the Bachelor version of the Hunger Games. I think that’s not a very good description because the only thing they have in common is that they both take place in a dystopian society and both plots revolve around a sort of Reality TV show premise. In The Selection, America Singer is one of 35 girls picked to compete in the Selection, and win the heart of Prince Maxon. It’s all taped and televised and other things happen too. The Queen is about the Queen Amberly, Prince Maxon’s mother’s own Selection, that she obviously won since she is now the Queen. It doesn’t add too much to series but it does gives more of a look at King Clarkson, who is sort of the villain in the series. Why he is who he is and also a little sadness for Queen Amberly. She is a good person who truly loves him and he likes her because he knows she will do whatever he says and is easy to manipulate. Not exactly a romance. The second is Burnt Sugar, a prequel novella of Firebug by Lish Mcbride. You may remember that Firebug was one of my favorite books from last year This short story is about Ava, Lock and Ezra on a job for the Coterie to collect money from a witch who has stopped paying her “protection” payments. Of course, the job goes awry as they run into some unexpected complications. As is, the witch lives in a Gingerbread house, eats kids just like in Hansel and Gretel and they get captured. I love their team dynamic. Lock the responsible leader, Ezra the fox doing what foxes do and Ava, who sort of just likes to wing it. It has the same sense of humor as the book but just a small dose. Just enough for me to pine even more for the next book. And finally Carnival of Lies is a novella from the Untamed City series by Melissa Marr. The first book, Carnival of Souls (now published as Carnival of Secrets) was published in 2013 and sadly there is no plans at the moment to publish a sequel. I’m not sure if it’s one of those things that the first book didn’t do as well as they’ve hoped so the cancelled the rest of the series or if Melissa Marr is too busy writing other series. She just published another Teen book called Made for You, which was only ok. She is also co-authoring a kids series about Norse Mythology. Whatever the reason, we must be content with Carnival of Lies. A little background: a class of Diamons runs the City. They have killed almost all the witches and those who survived have escaped to the human realm. The city holds a carnival where one can pay for murder or death. Once a generation, a competition that is held. The winners are raised to the ruling class. The Losers are dead. In Carnival of Lies, we follow Aya as she decides to compete and her betrothed Belwas, who enters to try to save her. Honestly, there doesn’t seem to be much of reason for this story. We know why she entered the competition because it was revealed in Carnival of Secrets. She was born a witch and her Diamon parents who were bewitched to believe they are her real parents. If she were to marry Belwas and have children, as she would have too, then she would be revealed for what she is and put to death but if she wins and becomes part of the ruling class, she could live without ever having to marry and have children. Since there is sequel on the horizon, I was really hoping for something more. This really didn’t do much for me. All three were a nice break from the multitudes of characters, subplots and pages of Game of Thrones and revisit some old characters and series that I really do enjoy. Now back to my regular schedule of novels.